Robert Sawhill was born on December 13, 1930, in Carnegie, Pennsylvania. He was commissioned a 2d Lt in the U.S. Air Force through the Air Force ROTC program at the University of Pittsburgh on May 23, 1952, and went on active duty beginning July 3, 1952. Lt Sawhill served as an Admin Officer with the 3615th Air Base Group at Craig AFB, Alabama, from July 1952 to February 1953, and then completed pilot training and was awarded his pilot wings at James Connally AFB, Texas, in January 1954. He next completed All Weather Interceptor pilot training at Moody AFB, Georgia, in July 1954, followed by service as an F-89 Scorpion pilot with the 66th Fighter Interceptor Squadron at Elmendorf AFB, Alaska, from July 1954 to August 1956. 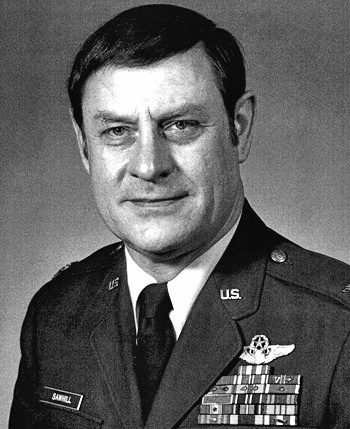 Capt Sawhill served as an F-94 Stafire, F-102 Delta Dagger, and then F-106 Delta Dart pilot with the 48th Fighter Interceptor Squadron at Langley AFB, Virginia, from August 1956 to December 1963, and then as an F-102 pilot with the 68th Fighter Interceptor Squadron at Itazuke AB, Japan, from December 1963 to June 1964. His next assignment was as an F-102 pilot with the 40th Fighter Interceptor Squadron at Yokota AB, Japan, from July 1964 to June 1965, followed by service as an F-4 Phantom II pilot and Air Operations Officer for the 33rd Tactical Fighter Wing at Eglin AFB, Florida, from July to September 1965. Maj Sawhill served as an F-4 pilot with the 40th Tactical Fighter Squadron at Eglin AFB from September 1965 to May 1967, and then as an F-4 pilot with the 497th and then 555th Tactical Fighter Squadrons at Ubon Royal Thai AFB, Thailand, from May 1967 until he was forced to eject over North Vietnam and was taken as a Prisoner of War on August 23, 1967. After spending 2,031 days in captivity, Col Sawhill was released during Operation Homecoming on March 14, 1973. He was briefly hospitalized to recover from his injuries at Wright-Patterson AFB, Ohio, and then attended the Industrial College of the Armed Forces at Fort McNair in Washington, D.C., from August 1973 to July 1974. 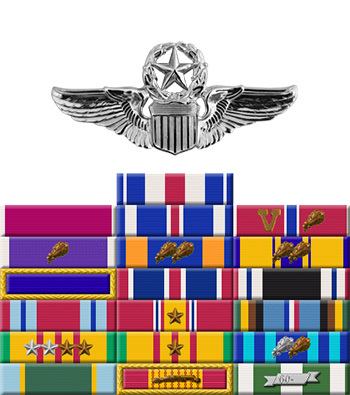 After serving with Detachment 2 of the 1135th Air Force Special Activities Squadron, he served with the 25th Air Division at McChord AFB, Washington. Col Sawhill's final assignment was with the National Guard Bureau at the Pentagon, where he retired from the Air Force on September 1, 1982. Robert Sawhill died on June 26, 2009, and was buried at Arlington National Cemetery. For the period October 1967: This officer distinguished himself by gallantry and intrepidity in action in connection with military operations against an opposing armed force during the above period while a Prisoner of War in North Vietnam. Ignoring international agreements on treatment of prisoners of war, the enemy resorted to mental and physical cruelties to obtain information, confessions, and propaganda materials. This individual resisted their demands by calling upon his deepest inner strengths in a manner which reflected his devotion to duty and great credit upon himself and the United States Air Force.